KEFIR IS A DELIGHTFULLY NOURISHING AND REFRESHING FERMENTED MILK DRINK THAT HAS BEEN ENJOYED AROUND THE WORLD FOR THOUSANDS OF YEARS. WE MAKE OUR KEFIR WITH NON-HOMOGENISED MILK TO KEEP IT AUTHENTIC, PURE AND NATURAL. We use glass bottles (which you can reuse or recycle) and uncoated paper for our labels so we have no plastic footprint. We use non-homogenised milk from a single herd on the Cowdray Estate which is committed to sustainable farming practices. Our kefir is gluten free and has no added sugar, artificial colours, flavours or preservatives – just billions of live cultures. Susana & Daughters is a small, sustainable family business based in the beautiful South Downs, where founder Susana Perez makes her natural, wholesome kefir on the Cowdray Estate. ‘A career as a financial analyst with a multinational corporation led me from my native Barcelona to Holland then London before settling in Chichester with my English husband, Ed. Some years later I was ready for change; change that would give me a better work/life balance and the opportunity to create something for and with my two young daughters. It was on pilgrimage, along the famous Camino de Santiago, that the seed of change was planted. Inspiration came from thoughts about my own childhood, growing up on a healthy Mediterranean diet and competing regularly as a black belt in Judo. A grandmother from the club had introduced my family to home-made kefir, believing it helpful for fitness, strength and general wellbeing. (My Dad has taken it ever since). And there it was! The idea to start a small-batch kefir business took root – a business that would reflect my ethical values so that I would be proud to put my name on the bottle. Complete transparency, that was the goal. My kefir had to be made with milk from a single, free-range herd and sustainably produced, by hand. It would be delivered in glass bottles to farm shops and health stores that shared my beliefs. And most importantly, it had to pass the critical family taste test! After plenty of trial runs, my family was still surprisingly enthusiastic when I hit upon the batch my daughters were very happy to drink. The secret? Not too fizzy, not too sour, not too thick, but bursting with goodness and just the right amount of creaminess. My recipe was ready!  Our Kefir is made by adding live and active kefir cultures to non-homogenised milk produced on the Cowdray Estate and then letting the mixture ferment slowly and at the right temperature to develop its creamy goodness and flavour. And that’s it – nothing else! The culture is made from kefir grains, a living colony of naturally occurring beneficial bacteria and healthy yeasts that were first found in the Caucasus Mountains thousands of years ago. Kefir is also a true super food. Naturally packed with calcium, vitamins and billions of friendly bacteria, this delicious cultured milk drink has unparalled probiotic properties. The health benefits of kefir have been established over many centuries – in fact the word ‘kefir’ itself literally means ‘long life’ in old Turkish! Our kefir combines all the natural goodness of milk with the additional advantages of billions of live cultures. To help support the natural flora in your tummy. To help build and repair muscles and tissue. To help build healthy teeth and bones. To help with all kinds of metabolic functions. To help your body work well and stay strong. The Cowdray Estate is located at the heart of the beautiful South Downs National Park in West Sussex. The Estate’s milking cows enjoy a diet of rich grassland pasture and are very well cared for in line with the management’s commitment to holistic and sustainable farming practices that prioritise animal welfare and soil health. 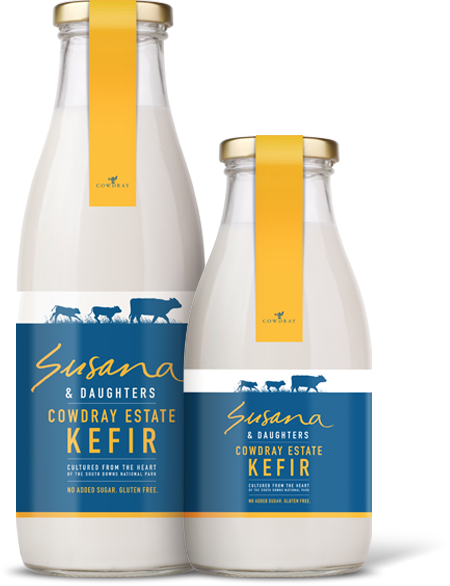 Susana & Daughters make their kefir from Cowdray Estate milk only, so every batch can be traced back to milk from a single herd. The milk is pasteurised on arrival at Susana’s converted stable kitchen then fermented, tested, bottled and refrigerated on site before being distributed to the Cowdray Farm Shop and other outlets. Want to stock our kefir? Keen to know more about our products? Then send us a message, we’d love to hear from you.